BANGI, 10 Nov. 2010 — Malaysia and the Latin American nations need to reach out to rediscover each other, identify common goals and work together for mutual benefits. 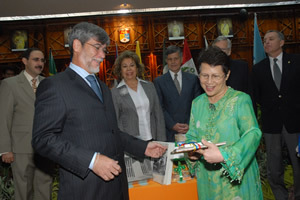 This is because trade between them is expanding and becoming increasingly important to each other, said the Vice Chancellor of Universiti of Kebangsaan Malaysia (UKM), Prof Tan Sri Dato’ Dr Sharifah Hapsah Hasan Shahabudin, when officiating an International Symposium to Commemorate the Bicentennial Anniversary of Latin American Independence, here today. The two-day symposium is jointly organised by the Institute of Occidental Studies (IKON) of UKM and the Latin American Embassies in Kuala Lumpur. The theme of the conference is “Latin American Identity as a Goal of Democracy” and among its main objectives are to foster better understanding of Latin America; to appreciate its rich cultural traditions; to discover similarities and to develop people-to-people ties. Among the speakers are the Mexican ambassador to Malaysia Melba Pria, a representative of the Institute of Political Science of Chile Dr Manfred Wilhelmy, Mr Ezqueil David Grimson from the National Library of Argentina and the Venezuelan ambassador to Singapore, Mr Alfred Toro Hardy. Prof Sharifah Hapsah said UKM with an international reach is proud to be a partner in ushering the celebration, as it takes a keen interest in developments beyond the Malaysian borders or its immediate geographic region. 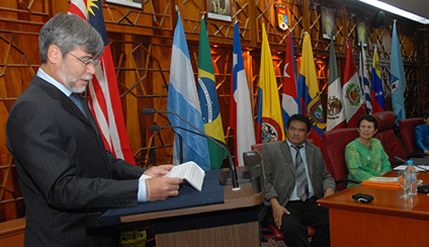 UKM is one of the few academic institutions in the region with a research institute focusing on the occidental regions which includes Latin America, the Institute of Occidental Studies (IKON) which was established in October 2002. “Our university, through IKON, aims to contribute to the discourse on the Occidental world but from a non-occidental perspectives. Mutual understanding and mutual appreciation of each other is an imperative prerequisite to any meaningful inter-civilizational and inter-cultural dialogues,” she said. She noted that the 1st International Colloquium on Latin America Studies was held in 2008 and since then, there has been an increase in activities between IKON and the Latin American embassies, resulting in, among others, the translation of a book “ALIEP” by Prof Zakaria Ali of IKON. Meanwhile, the Ambassador of Venezuela to Malaysia, Mr Manuel Antonio Guzman Hernandez in his welcoming remarks, said the celebration of the 200 years of independence has a major historical importance for all the Latin American countries, although each nation achieved its independence at different time. “But the truth is that, it is the best excuse that we could find to step forward in the construction of an academic bridge between Malaysia and our continent,” he said. “For this reason, we canot waste any possibilities or communication initiatives to know each other better,” he said, adding that Latin America has much to learn about Asia and vice versa. “This symposium serves as a step for universities, people and governments of each continent to get to know each other better, to lend a helping hand and contribute in building a better world together,” he said.